In 1901, the Portuguese royal family embarked on a visit to the island of Madeira and Azores. The event was a great honor for the local populations but presented them with a difficult problem: how do you choose a gift for monarchs who have everything? 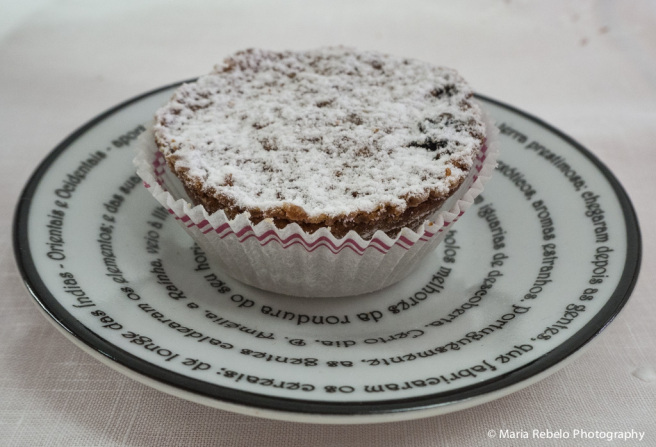 The Azores Terceira island offered queen Dona Amélia a new cake made with local ingredients: corn flower, raisins, sugar cane molasses, and cinnamon. The queen enjoyed it so much that the new creation became known as the Dona Amélia cake. More than a century later, the cake continues to be popular in the Terceira island and for a good reason. We loved the Donas Amélias we tried at O Forno, a great pastry store in downtown Angra do Heroism. The ability of royalty to inspire the delicious Donas Amélias makes us wonder whether we should restore the monarchy. O Forno is located on Rua São João in Angra do Heroismo, Terceira, Azores, tel. 295 213 729. I like the look of that very much indeed! Take it along on the trip! And there is no gluten! When will you be sending them over? Welllll….I’d have to get to Portugal first. Though I might find a recipe… In any case, when I send them to you I will be certain to denote that it is a gift. Also, I will need to get over the gov. of Florida who decided he wanted to decrease the bear population and allowed people hunt bears. Oh dear! I have such mixed feelings about hunting. Most of me hates the idea, but there’s a tiny bit of me that understands the arguments for controlled hunting, especially when I see how overrun we’ve become by foxes since hunting them was banned. But hunting bears – horrible thought! Gluten free. Sign me up! First I have to see if I have a recipe for it.